Yes, a man like Dan Cathy who donates to causes that pathologize sexual preferences he doesn’t like and spins up hate against other people for the — gasp! — crime of loving someone he doesn’t approve of should be protested and called out. 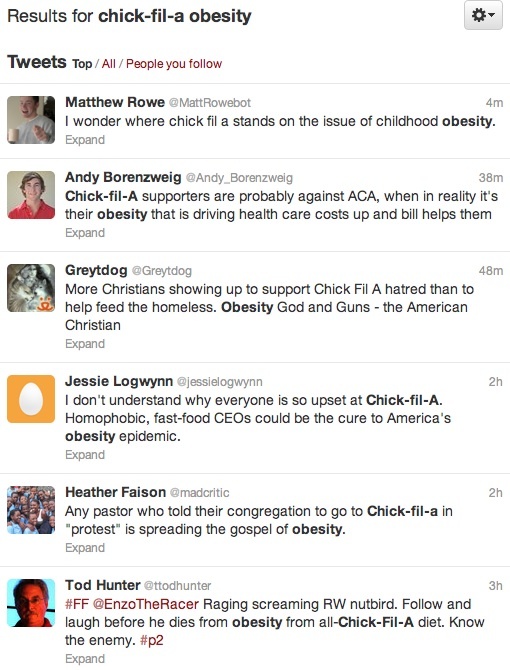 But no, Dan Cathy’s views are not somehow worse since fat people are among the patrons of his business. And no, fatness doesn’t somehow compound the bigotry of his supporters. 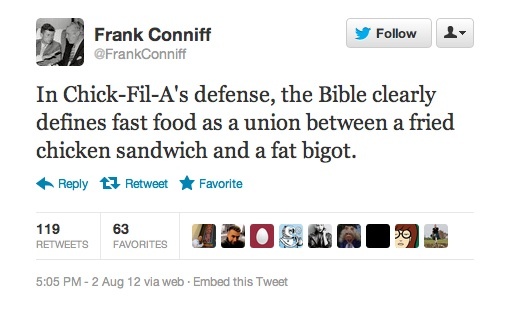 And no, fat bigots who support Dan Cathy aren’t prime targets of protest any more than a thin bigot is. In other words, fighting ignorance with ignorance means you’re no better than the bigots you’re fighting. Oppressing me doesn’t set you free. 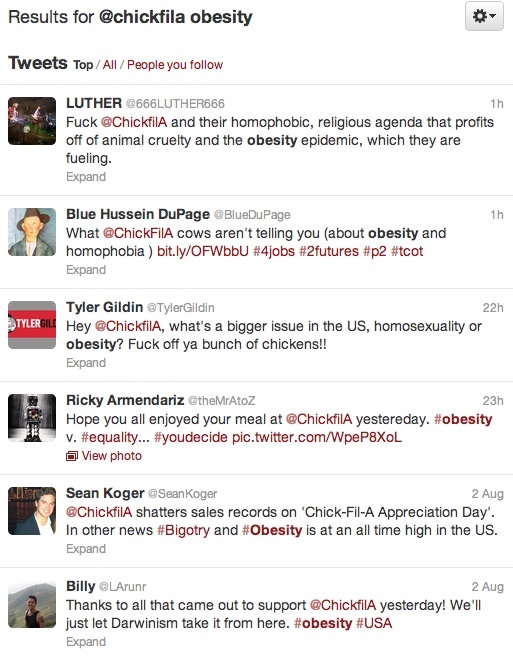 I’ve included several images here of tweets made by famous/influential/sorta-influential people that try to fight homophobia with fatphobia. Wouldn’t it be more timely to showcase a study on how damaging homophobia is? Oh no wait, fat people are bad always, acceptable targets always. 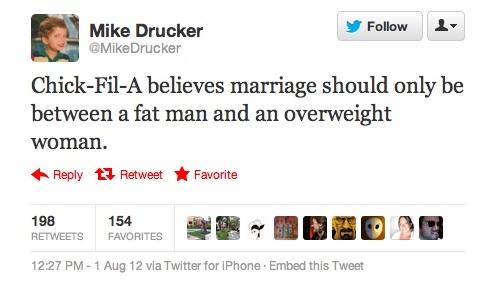 Fatties marrying is gross and reprehensible and is totally an argument against straight-only marriage somehow (though I’m pretty sure there are like, loads of gay fat people) #1. Indirect death threat against fatties #2, also implying they’re stupid/unevolved. 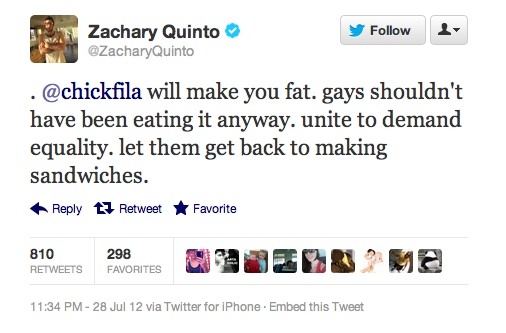 Ha, cuz only fat people eat fast food and fat bigots are worse than thin bigots. Get it? 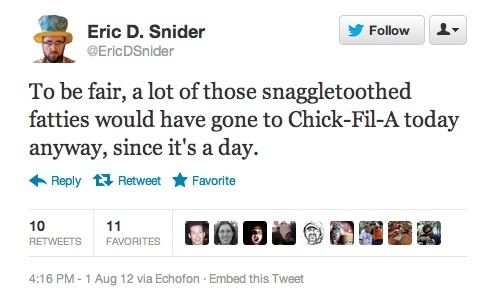 So that’s why saying fat bigots is a zinger. Fat. Faaaat. 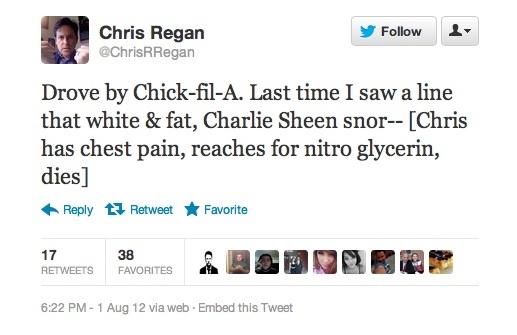 Hahaha fatties and their diet Coke, get it? This person is apparently a comedian, and she can’t come up with anything less shopworn than that? Hahaha, fatties can’t stand for things, they don’t have values or opinions. They’re just obsessed with food, food, food. 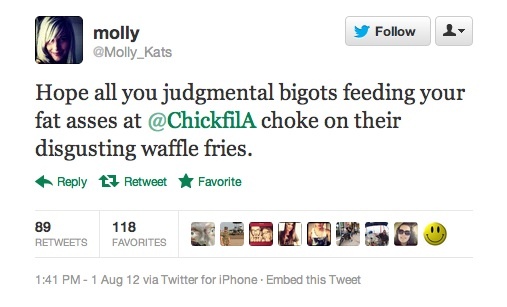 Not only are you a bigot, you’re a mcfatty fat bigot with a fat-clogged brain. Fatty! Who’s “we” here? Did I suddenly become a hivemind with my other fat Americans? Because I didn’t get the memo. Probably because I am fat. 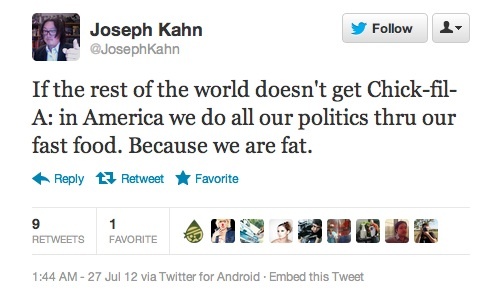 Way not to nakedly scapegoat fat people while you were trying to make your point, guys! Except, that’s exactly what you did. 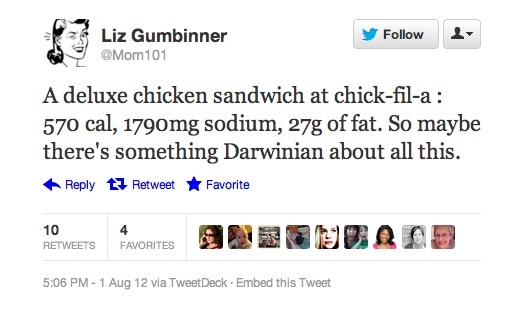 This entry was posted in Mainstream Media, Moral Crusades, Moralizing Fat, News. And this is a perfect illustration of why, whilst certainly not identifying as a conservative, I have no time for the current crop of ‘trendy’ fauxgressives either. 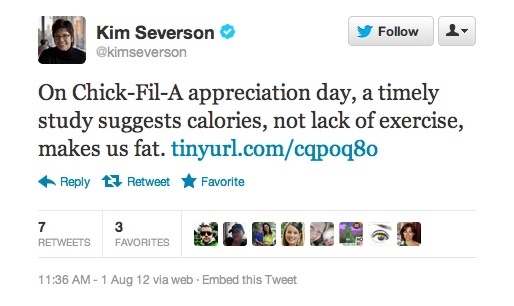 I know a few who (no doubt taking their cue from Michelle Obama, Jamie Oliver and other prominent figures who’ve claimed the lifestyle liberal tag) having set fat people up as the embodiment of right-wing stupidity and ignorance they routinely deny the oppression heaped upon us by society, instead ascribing us a power to overconsume and destroy that any casual review of the evidence linking weight and spending power would quickly disprove. A few years ago you identified and displayed your membership of this club through gestures such as driving a Prius; now that ‘obesity’ has replaced AGW as the cause celebre of the chattering classes it seems that fat jokes and finger pointing are increasingly the order of the day.